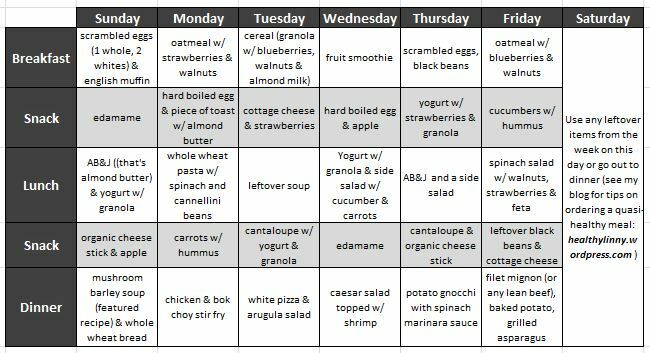 In an effort to help you plan your meals better, I am including a sample menu that you could use for the week, as well as a corresponding grocery list and a list of things that you should have in your pantry that you will need. Please TRY to cut out any processed foods from your diets and buy fresh ingredients from your local grocers, farms and butchers. As I have written before, I live in the stix and have found local vendors…if I can do it, SO CAN YOU! Good luck and let me know how things turn out! CAVEAT…yes, I know this is a long list and I know it’s expensive BUT…try to keep a tally of what you spend in a given week when you are ordering in or going to lunch with co-workers or even if you are making multiple runs to the grocery store versus the one BIG trip. You will probably see that it evens out, in fact, you may even see a savings with the one trip. In the end, your body, your health and your family’s health should be top priority. You can certainly modify here to cut costs and I’m happy to hear your feedback.